Many kids these days don’t have the hand strength they need to complete simple everyday tasks. 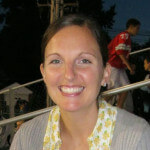 One of the most common reasons kids get referred for occupational therapy evaluations is because they’re showing one or more of the red flags indicating that they have weak hands. Teachers or parents notice that a child is struggling with scissor skills, clothing fasteners, or pencil grasp and they call on me for suggestions and support. Sometimes, hand weakness can be attributed to a specific diagnosis or medical condition that is present for the child. But, over the past several years, I’ve noticed an increase in referrals for kids who don’t have identified diagnoses and who are not struggling in any other area than hand strength and fine motor skills. My best guess is that it has something to do with the dramatic difference between the play experiences and daily routines of today’s kids compared to our day-to-day experiences when I was a kid in the 1980s. It seems that today’s kids aren’t getting as much exposure to the everyday play activities that naturally build hand strength. These days, babies spend a lot of their time in carriers, car seats, and strollers. This, along with the increased awareness of the “Back to Sleep” campaign (promoting positioning babies on their backs to decrease the risk of Sudden Infant Death Syndrome) means that babies are getting less exposure to tummy time. When babies are on their tummies (prone position), they’re doing more than just playing. This position provides infants (and big kids) with important motor, sensory, and strengthening input, including weight bearing in the hands. When they’re on their tummies, babies and kids push up on their hands to see the world around them. They shift their weight from one hand to the other as they reach and grab for their toys. And this weight bearing equals hand strengthening! Less time spent in the prone position means that babies are getting less exposure to important hand strengthening opportunities when they’re young. Once babies master tummy time, they graduate to the quadruped position (all fours) and eventually begin to crawl. For months (until they begin standing and walking), crawling will be their primary means of exploring and experiencing the world around them. Just think of all of the hand strengthening benefits babies are getting when they spend nearly all of their waking time crawling and bearing weight on their hands! Again, more time spent in strollers, cars eats, and carriers means less time crawling, exploring, and moving on the floor. When babies miss out on these important movement experiences, one result can be decreased development of the muscles of the hands. These days, our kids face another huge obstacle to building hand strength (and strength throughout their entire bodies) that wasn’t present for kids of previous generations: screen time. More screen time and more time with a video game controller in hand means that kids these days aren’t getting as much exposure to toys and games that include small pieces, manipulatives, and moving parts that require fine motor coordination and manipulation. Think Legos , Trouble , or card games. An increase in screen time and more sedentary play has other negative effects on the development of hand strength too. When kids are spending their days in front of a video game system, tablet, or computer, it means that they’re spending less time outdoors and engaged in active play experiences. Just think of all of the important hand strengthening opportunities kids get when they’re running around with their friends outside – climbing ladders on the playground, climbing trees, crawling through tunnels, swinging from the monkey bars. All things kids are missing out on when they’re spending the afternoon inside playing video games. Because of these barriers, art and craft activities aren’t a regular part of the daily routine for many kids. We think it’s so important for parents to realize that kids get huge hand strengthening and fine motor benefits from activities as simple as playing with play dough or snipping paper with mom. 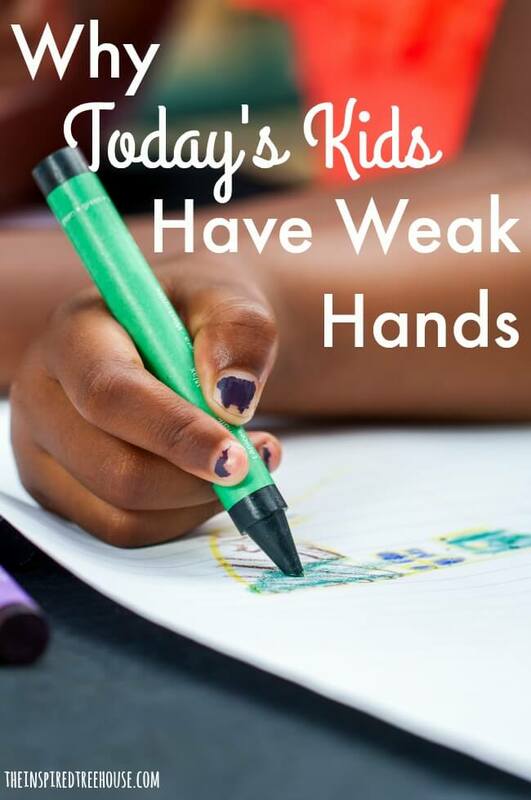 Many families also don’t know that these early experiences with and exposure to scissors, crayons, and pencils truly impact the development of kids’ hand strength and their ability to use these tools in a more refined way as they get older – for handwriting, cut and paste worksheets, etc. 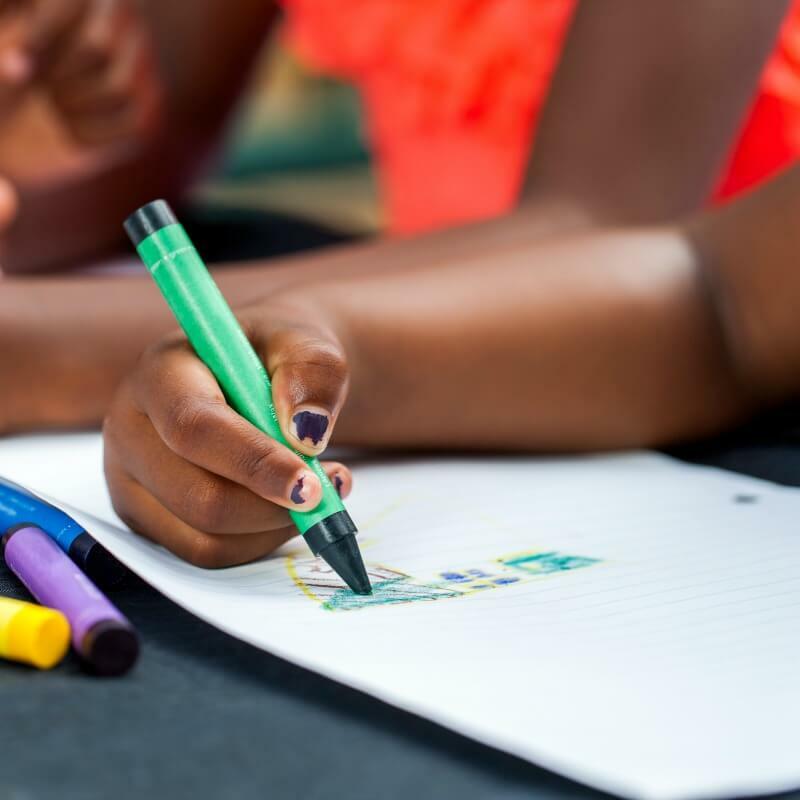 Finally, something we’ve noticed in our therapy practice is that kids who have weak hands and fingers tend to be the ones who avoid or flat out refuse to participate in fine motor activities and games because these activities are challenging, tiring, and frustrating. This can become a vicious cycle as the child experiences less and less exposure to the very activities he or she needs in order to build strong hand muscles. Don’t worry – the story of our kids’ fine motor skills and hand strength doesn’t have to be all gloom and doom! There are tons of fun and simple ways to build hand strength through play! 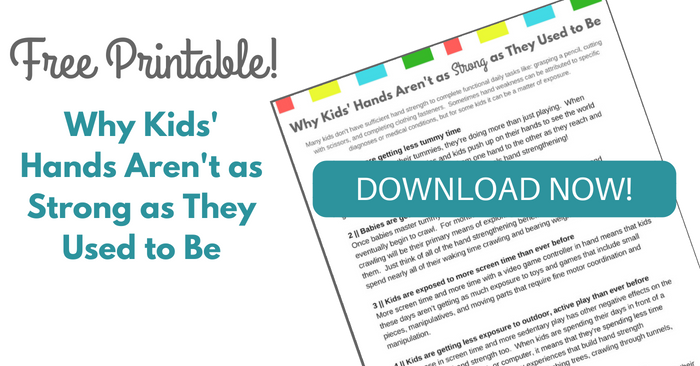 Not sure whether your child or a child in your classroom has weak hand muscles? Check out these red flags for weak hands. And learn more about how to build hand strength through everyday play! This 23-page printable digital resource is packed with more than 30 ideas for building hand strength through play and includes QR codes that lead to engaging video clips of each activity. The resource also includes printable cards with the scannable QR codes and suggestions for using them at home, in the classroom, or in the therapy room. Thanks for sharing! I’m not the crafty type, but this is motivating to make it priority!